100% Australian made & owned product. K & G Machinery has been manufacturing our C.O.C.K.S de-clipping trollies for the last 3 years, during this time we have developed what we believe is the best and safest trolley to remove Pandrol “e” clips in Australia. Our latest version 4 of the declipping trollies are fully adjustable for track gauge from a base of 1000mm and upward, they are adjustable to suit any rail size and wear, we have also now incorporated a large mounting plate so that different couplings can be interchanged onto the trollies, this enables our customers that work on multiple gauge tracks with different hi-rail equipment to only require the one declipping trolley, whether it will be used with a Hi-rail Excavator, Pettibone or both. Safety, this is by far the safest way of removing “e” clips without endangering workers of any injuries, the clips strike the rubber shrouds and fall within the working area of the trolley. Speed, because the trolley can be set to remove the clips from either one rail or both, it is just a matter of travelling the machine with the trolley over the re-railing area in both directions to safely remove all of the clips. Flexibility, this trolley can be adjusted to suit different rail sections and different rail head wear, ideal for Heavy Haul tracks that carry out continuous rail grinding. Economics, 1No machine, 1No trolley & 1No operator to remove kilometers of clips. What Are Pandrol “E” Clips? 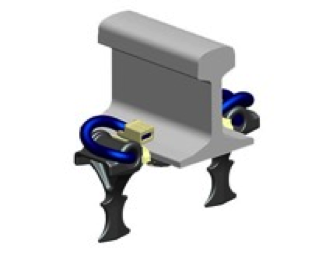 Pandrol “e” clip systems are used in most countries around the world, and are standard in a variety of railway systems, Heavy Haul, Freight, Passenger, Metro and Light Rail. Why Should You Choose our Declipping Trolley? Declipping trolleys are specialized accessories made just for removing Pandrol “e” clips in large quantities safely and at speed. Choose K and G Machinery’s C.O.C.K.S declipping trolley for your next re-railing project and benefit from all of the features our trolley has: it features fully adjustable declipping arms made of Bisaloy, a rubber shroud that adjusts with the machine to maintain its height ensuring the clips are caught, an excavator type hitch to suit hi-rail excavators fitted with engcon tilt-rotators or a hitch to suit the knuckle boom of hi-rail Pettibones, and heavy duty springs to maintain the down pressure tension whilst removing clips. Overall, the entire declipper trolley is adjustable to suit both smaller and larger rail sections as required. Now with one C.O.C.K.S the contractor can work on any track gauge using different hi-rail equipment available. The C.O.C.K.S trolley can be lifted and loaded by forklift, using the fork tubes, or by any machine with a lifting hook with 4 leg chain utilizing the 4 lifting points. All in all, it can remove the clips from both legs of a railing at the same time in one direction, or it can do one rail at a time as required.